BRUSSELS, Belgium -- UEFA president Michel Platini said Monday he doubts whether Ukraine will be able to co-host the 2012 European Championship and complained that work on one of its four stadiums had stopped. Speaking at the European Union, Platini said construction in western Lviv "has made no progress whatsoever," while work on the showpiece stadium in Kiev had fallen behind schedule. Platini said that if the stadium in Kiev was not ready, Ukraine would be unable to co-host Europe's premier football event. "I am worried because we put our trust in a country, in a policy," he said. Platini will travel to Kiev next week to assess the troubled construction works and ask the new government to bring development up to par with that in co-host Poland. UEFA warned both countries in September 2008 to speed up construction or risk losing the three-week long tournament. 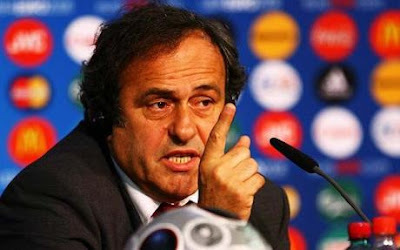 On Monday, Platini said Poland's preparations were on track. "For Poland all is going well. It is in Ukraine where it is a bit difficult," he said. Both co-hosts have to provide four stadiums. In Ukraine's case, Kiev, Lviv, Donetsk and Kharkiv are to host matches. Lviv, a western city of 735,000, laid the foundations of a 30,000-capacity stadium in February 2009 but progress since had been too slow, Platini said. Construction at Lviv had moved forward "not by an inch. So yes, I am worried," he said. He also said renovation work on Kiev's 63,000-capacity Olympic stadium was going too slowly. The stadium is due to host six matches, including the 2012 final. Platini said failure to complete the stadium would mean the end of Ukraine's participation in the championship. "If there is no Kiev, then no Ukraine," Platini said, before backtracking slightly. Explaining that Kiev's "difficulties" were in part due to an unusually harsh winter, Platini said, "I think Kiev will be all right in the end." Platini also refused to be drawn on whether Germany could take Ukraine's place. "There is no Plan B," he said.